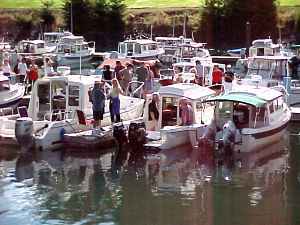 Nearby campsites: Deception Pass State Park, a few miles from the launch ramp. Comments: This launch ramp is just down the street from EQHarbor, a great C-Dory dealer and Honda service center. 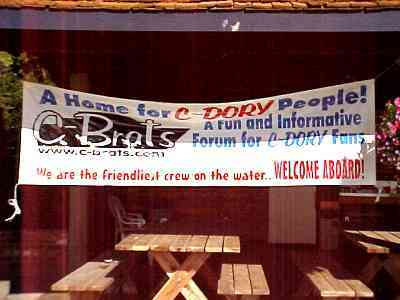 -----The Washington C-Dory owners have been particularly active in organizing gatherings - their meetings are famous among C-Dory owners. 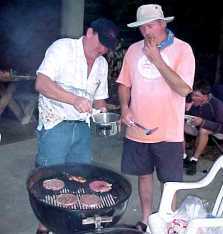 The '03 Blakely Gathering certainly continued the tradion. 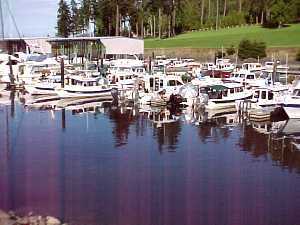 There were 24 boats and we almost filled the Blakely Marina. The weather was perfect, the food incredible, and the company the best. 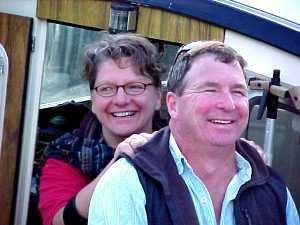 -----A special feature of the Washington folks is the christening of new (or new to the owner) boats. Rev. Dave has composed a lengthy ritual, interspersed with ample toasts. A sprig of green must be placed on the bow. 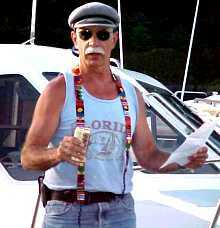 Of course, a touch of libation on the bow and in the water for Poseidon is standard. 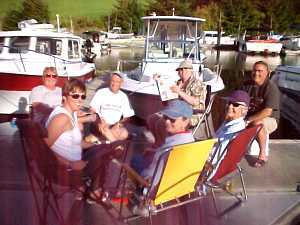 Everyone participates and the boat is well and truly blessed. 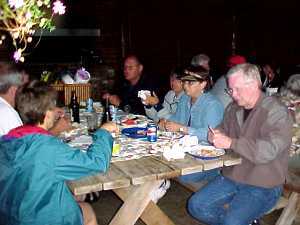 -----What a great potluck cookout under the marina's cabana that evening. 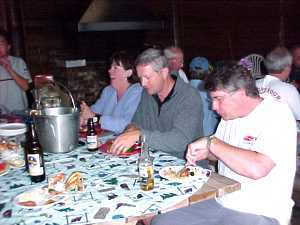 There was a choice of fresh-caught crabs, hamburger, salads, pies and cakes - all well-lubricated with Snoqualmie brews. Nothing like having C-Dory owners who also own a brewery! 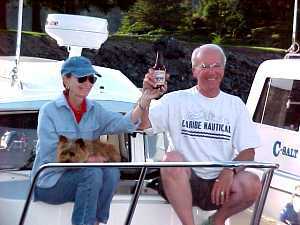 -----We had been in Alaska the early part of the summer, and hot-footed down in order to meet the Washington folks and be there for the christening of boats at the Blakely Marina. We weren't sure we would arrive in time so we didn't tell anyone we were coming. So, we doubly enjoyed it, since we had to push to get there.